Today is Halloween, which is without a doubt my favorite day of the year. It’s one of those days where even adults can act like kids and playing dress-up is OK. People love to mark the occasion by visiting haunted houses, watching scary movies, and telling ghost stories. So everyone grab a popcorn ball and some of those little peanut-buttery candies in the orange and black wrappers and turn the lights down low, because it’s time for Dr. Jayne’s Top Ten List of Horrifying and Frightening Things. 9. Physicians who demand that allergy checking and other EHR decision support be completely disabled because they “know all that stuff already.” I understand (and loathe) alert fatigue as much as the next gal, but seriously, I can’t imagine that there’s a physician who has never accidentally prescribed a medication to someone who was allergic to said medication. I know I’ve done it and you know you’ve done it at least once in your career, too. If that doesn’t scare you into leaving the allergy checking active, it should. 8. Shortages of common medications, including vaccines and chemotherapy drugs. Often these are low-profit margin generics and are made by only a handful of manufacturers. If one of them experiences production issues, the entire supply is threatened. Something to think about the next time you read about all drug makers being branded as greedy. 7. Celebrities and politicians dabbling in the public health sphere by adding to vaccine hysteria. Want to see something really scary? Pictures of vaccine-preventable diseases. I wish they’d spend their time advocating anti-drug and anti-obesity propaganda instead. 6. Patient-facing software vendors who do not have licensed physicians on staff (or at least as consultants.) I’m not sure how they evaluate usability, let alone suitability for patient care. The only thing scarier is the hospitals and health systems that actually purchase this software. 5. Hospitals and ambulatory organizations that implement patient-facing software without physician leadership or oversight. I recently moonlighted at a JCAHO-accredited facility that had an allegedly certified system. However, for some reason, the prescriptions printed without a medication route. The system also had “never use” abbreviations on the prescribing screen. I’m not sure why they were printing on paper in the first place, but with obvious patient safety and regulatory issues to address, I didn’t pick the eRx battle that day. 4. Congressional rule-making that increases health care costs in the name of balancing the budget. I’m talking about the ridiculous change that made patients obtain prescriptions in order to use flexible spending accounts to reimburse over-the-counter drugs. Let’s see, the reason they’re over-the-counter is because they don’t require a prescription. But now, to save money, I have to get a prescription for my OTC med (after paying a co-pay), take it to the pharmacy, waste their time submitting it to my insurance to get the denial because it’s OTC, then pay cash for it and submit it to my FSA overseer. If they thought this process was going to deter patients, they were wrong (I’m not sure they thought it that far through the process, though) because patients are coming in droves for these scripts and some offices are charging fees for preparing these extra prescriptions. There’s a whole lot of spending going on here and it’s your fault, Congress. Next time you’re going to do this kind of thing, can you please ask a primary care doc his or her opinion first? I’d rather be counseling the obese, hyperlipidemic, hypertensive diabetic about his cardiac risk than writing another prescription for little Johnny’s diaper cream. 3. The fact that the item above is only a teeny, tiny, microscopic piece of what Congress has done or is trying to do with healthcare. I’ve got an idea: Let’s form a Congressional HMO, enroll all the legislators and their families in it, and use it as a pilot site for health care reform proposals. Once they prove efficacy on a captive population, only then should it be allowed to see the light of day. Muahahaha! 2. The emergency department at almost any urban hospital and quite a few suburban and rural ones, too. Overcrowding is often the norm, and due to fright-inducing Acts of Congress such as EMTALA, everyone is treated regardless of the ridiculousness of their chief complaint or its appropriateness for the emergency department. I know some hospitals were (and still are) guilty of patient dumping, and that is indeed a crime, but having to perform a medical screening examination on a patient who presents with “wants to know if I’m dyslexic” at 11 a.m. on a Saturday is a waste of resources. And yes, I really did see this patient, but only after the nurse had to spend his time assessing the patient’s pain score and asking him if he had an advance directive. This was in an ED that sees about the same patient volume as that of Massachusetts General Hospital, so it’s not like we were just sitting around shoe shopping on the Internet. 1. Watching providers adapt to ICD-10. I’m hearing lots about ICD-10 readiness and how software and billing systems will handle it, but am hearing very little about how organizations are actually going to train their providers to identify the appropriate new codes for old diseases. Word in the Doctor’s Lounge is that providers think EHR vendors will just automagically map the codes for them. They apparently missed the fact that it’s not a 1:1 conversion. If your vendor is telling you they’ll do this, you should be as frightened as if you just ran into Jason Voorhees and Freddy Krueger chatting at the coffee machine. I hope after all this you’re not too scared to open the door to trick-or-treaters tonight or to do some candy hunting of your own. Maybe you’ll stop by Casa Jayne and not even know it. I’m one of the “good candy” houses and my office at work is also well provisioned. I stocked up on Sweet Tarts and Sprees should a certain sassy sales exec decide to stop by. I’ll be in costume (of course!) but I’ll give you a clue — you’ll be able to figure me out by my shoes. I’ll bet Inga doesn’t have a pair of these! Great article. 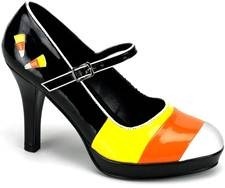 The shoe at the end is the icing on the candy corn. Never had the fetish, but now I’m thinking I could like this…. Touche, Dr. Jayne. You speak wisely and made me laugh knowingly. BTW, I like your shoes. Love the shoes! But also love #7 – really frightening especially when we are now seeing an increase in outbreaks of measles, mumps and whooping cough that can be avoided. Celebrities should stick to mugging for the camera and not speaking about things they know nothing about. I loved almost all….but no. 10: the HIPAA compliance zombies is my favorite. I have to admit I don’t normally read your articles as I don’t tend to have time with all the other GREAT stuff that gets posted. You have just won over a new convert. I LOVE this article. Keep up the great work as I’ll be making the time to read you from now on. An IT lackey with visions of grandeur.